Now I’m considering joining up for Becky’s next exchange – a scissor pocket … I love it ‘cos it’s a “no extras” exchange again, which is really appealing to me, rather than sending extras than people may not want. 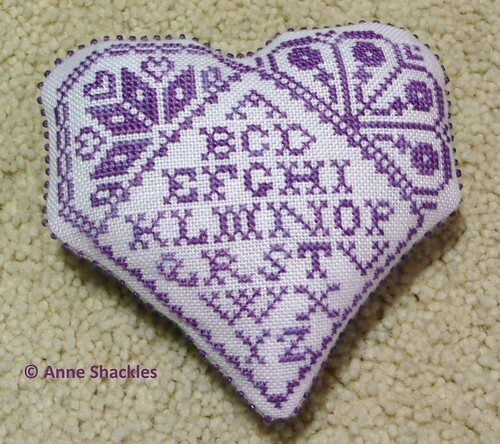 Anne S • This entry was posted in Cross Stitch, Exchanges, Finishes, Freebies, Piecework magazine, pincushions, Quaker and tagged Cross Stitch, Exchanges. Bookmark the permalink. How pretty. What a lucky lady to receive such a beautiful piece. What a charming gift, well done! A lovely heart pillow exchange. I would just like to say a big thank-you for the wounderful pin pillow that you made me, I did try to E-Mail you but it obviously did not reach you. I have admired this pattern for a while and now I have it, it is beautifully finished and edged with beads. This is a lovely pattern and I love the colour of the thread you chose. I love no extras exchanges, it really takes the pressure off. 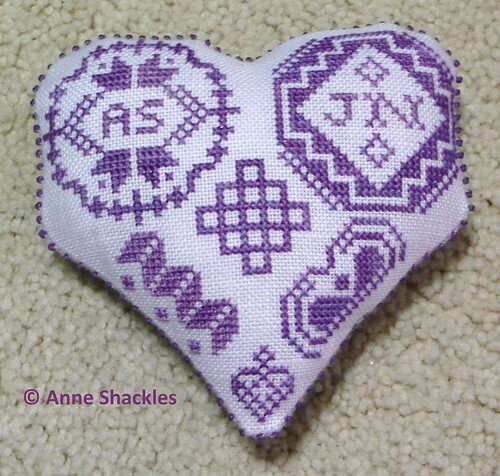 Beautifully stitched and perfectly finished, Anne. You do such lovely work; anyone would be thrilled to receive something from you!